Tomorrow night, from 8:30 PM to 9:30 PM, Earth Hour returns to encourage you to turn off all your electrical equipment (yes, even your computer!) and enjoy an hour of relatively technology free life. Light a candle or two, eat some ice cream, have a conversation face to face, listen to the world instead of your tv/cd/mp3/iPod/PC/Mac and so on. Go on, I triple-dog-dare you. 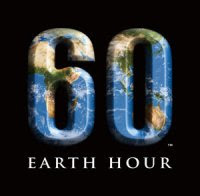 Oh i think i'm going to love this earth hour, so tomorrow at 8:30-9:30pm--let me plan ahead-i might forget!